When the owner of Pelsham Manor sent me an invitation to stay at The Madison, I simply could not refuse. It was a gloomy November morning, I swung my chair around to ask my fellow romanticist and ‘froleague’ Charlotte if she’d like to join me for a long weekend away in the country, and the pair of us consulted our diaries to ink in the soonest date we could find. Friday morning we met at the office, hurried our emails and scheduled our out of office with a squeal. Our record journey to Rye meant we arrived just as dusk fell. As the rest of the team will confer, it takes something quite extraordinary to hush the pair of us, but extraordinary it was. The stately driveway brought us to a grand set of gates which drew open to invite us inside and Charlotte and I were dumbfounded by the grandeur before us. Beneath a sky sparkling with stars, Pelsham Manor was lit up like a castle awaiting a very special arrival! The house-proud owner embraced us with the warmest of welcomes and gave us the grand tour to ensure we felt right at home. He carried our bags up the sweeping staircase where our private suites awaited us. Charlotte picked the Chinese Suite, with its four poster bed and Chinoiserie hand painted silk wallpaper, while I meanwhile settled into The Madison along the landing. Always a popular choice for proposals, honeymoons and anniversary celebrations, this self-contained double suite is elegant and timeless with a whimsical femininity which is completely enrapturing… and it was all mine for the weekend! The owner left us to settle in and when the gates closed behind him, we could not believe that we had the whole estate to ourselves: no neighbours, total privacy and complete reign of this exclusive and exquisite country home. Needless to say, the Sonos sound system was turned up and the champagne popped open! 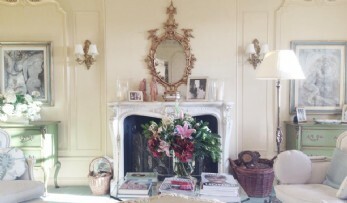 The candles had been lit and the fire ablaze for our arrival, so all that was left to do was to kick back and relish in the lavishness of every last detail. I woke at dawn, still bursting with excitement. I scurried across the hallway to find Charlotte fast asleep in her princess-style bed. It did take a bit of convincing, but the promise of homemade bread and poached eggs succeeded to lure her from her slumber. 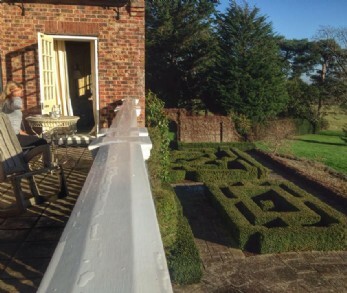 The morning sun soon melted the glistening frost making it warm enough to sit out on the balcony which adjoined our rooms and overlooked the fountain and croquet lawn. The owner had left us homemade cupcakes which were a real treat to follow with a fresh coffee. We retreated back to our swish private bathrooms for an invigorating shower and met on the terrace ready to explore the grounds. 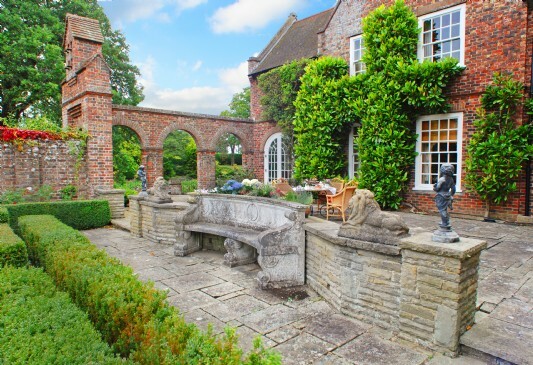 The gardeners are undoubtedly as conscientious as the housekeepers, from the croquet lawn to the parterre, orchard and romantic pond garden; through every gate was an area just as manicured as the next. The afternoon was spent moseying the cobbled streets of Rye, which was teeming with festive spirit. The streets were lined with rosy faces selling roasted chestnuts, candy floss and mulled wine which filled the air with a divine sugary scent. We ate at The Mermaid, one of England’s oldest and most iconic inns with a unique olde-worlde charm. After our hearty winter supper, that night we both fell asleep watching The Holiday in The Madison (thinking how Cameron Diaz's home stay didn't have a patch on ours!). The rest of the weekend was whiled away with a few spirited games of tennis in the grounds, a long walk along Camber Sands and a visit to the historical town of Hastings. On our last evening we met the owner for a delicious three course dinner in The George, a stylish and cosy bistro serving up fresh seafood caught from Rye Bay. It was fascinating hearing his tales about acquiring and living at Pelsham Manor, as well as more about the array of guests who have stayed over the years – and we were not surprised to learn so many return time after time. As well as being perfectly positioned for a Londoners wanting a short break by the coast, Pelsham Manor is accessible for everyone. From large celebration groups to couples wanting a romantic escape in The Madison suite (complete with its own kitchenette and spacious lounge area with open fire! ), here a smaller group-size really doesn’t mean compromising. On our departure, the whole team came to introduce themselves including the gardeners and delightful housekeeper Mrs Winter. Together they were just like a cast of friendly characters from a storybook, who work busily behind the scenes to ensure the house and grounds are always effortlessly immaculate. Putting my Unique Home Stays position aside, I can sincerely say that this splendid weekend will be one to talk about for years to come. We returned fully revitalized and glowing with stories of picture-postcard Rye and the glorious country manor that is Pelsham.